I was surprised to see some commentary in this answer and its comments indicating that Supreme Court Justice John Roberts is committed to maintaining status quo jurisprudence against substantial conservative swings, and that he might compensate for the appointment of conservative justices by moving left. What evidence is there for this claim? Do reputable commentators make this claim? The traditional argument in favor of this is John Roberts' vote in the first Obamacare case (and to a lesser extent the second). That suggested that Roberts was unwilling to overturn legislation over technical matters. Notice that after Byron White retired, the median justice was either Sandra Day O'Connor or Anthony Kennedy. Both of them, in their last few years before retirement, voted much more liberally than during the rest of their tenure. It is possible that Roberts might make a similar shift. There is definite support for that kind of change in jurisprudence. It is also worth noting that Roberts in 2016 was more liberal than either of those justices were except for their last few years. 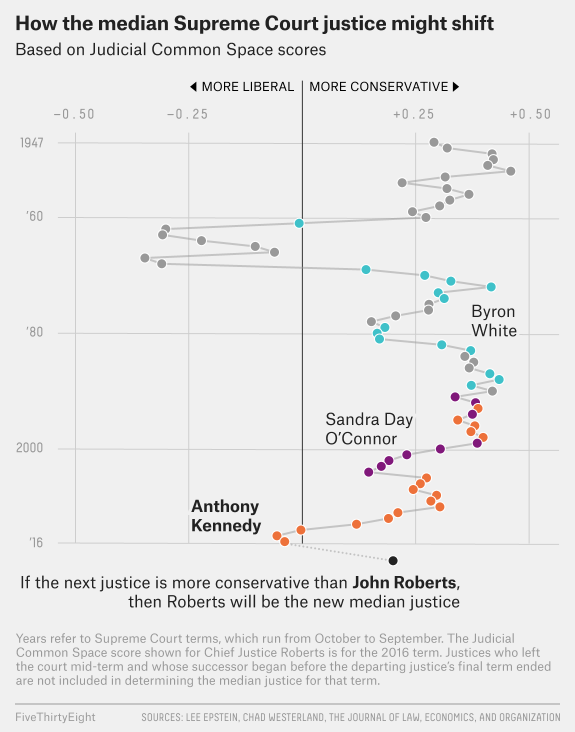 For most of their tenure, O'Connor and Kennedy were more conservative than Roberts currently is. Other than the 1960s, the last three years of O'Connor's tenure, and the last five years, Roberts' jurisprudence is mostly more liberal than that of the typical median justice. At least as measured by Judicial Common Space scores. At the beginning of his tenure, Chief Justice Roberts said he wanted to avoid 5-4 decisions because if people perceived the Court as a partisan institution, they would lose confidence in the institution more generally. I cite these as evidence that Roberts does care whether the Court is perceived as partisan. It's unclear how far that would take him in terms of voting. What is the constitutional status of military bases? What happens if Trump committed treason?